If you think about it, what director other than Paul Thomas Anderson could have been the first to adapt Thomas Pynchon for film? Pynchon is the high priest of postmodernism, after all, whose gargantuan Menippean satires can almost exhaust even the tireless obsessives of the Internet, who can convey more in 1,000 words than most feature films do in two hours of picture. Yet, it’s hard to envy Anderson translating Inherent Vice to the big screen — even if There Will Be Blood is one of the great meditations on the American character and Inherent Vice is one of Pynchon’s breezier works. (“Breezier” meaning no organic chemistry or 19th-century Russian imperialist history to worry about.) Apparently, Anderson started by literally copying the whole novel into screenplay format; that might sound strange, but honestly, there’s probably no better way to start scaling Mount Pynchon. But even a diehard Pynchonista has to wonder: How do you turn that hyperdimensional prose into an actual movie? What’s the cinematic philosopher’s stone that can transmute his unique alloy of literary gold into a work of light and sound dancing at 24 frames per second? Turns out, Anderson had the perfect weapon all along: Robert Altman. All directors have their touchstone inspirations. Yet what’s interesting and perhaps unique in the History of Auteurs Aping Other Auteurs is that Anderson didn’t just meet and befriend his idol, he got hired to be the backup Altman on the master’s final film, A Prairie Home Companion. To even the most casual reader of Cigarettes & Red Vines, this isn’t breaking news, but it bears pondering for any serious acolyte of PTA. Anthony Minghella once reduced directing to the act of choosing: It’s an intrinsically isolated exercise, a creative process whose crucible is the caged silence of its practitioner’s subjectivity. Sure, there are a million executives, producers, and pretenders who, with the breezy authority of those not ultimately responsible, will tell a neophyte director what he’s doing wrong. But directors tend to leave other directors alone. You can crib from another’s finished project all you want, but even if Steven Spielberg landed on your doorstep from on high, he knows he can’t really teach you how to realize your vision. Suffice it to say that it’s rare to get directors passing the secrets of their dark art to each other in the act of praxis itself, but if it’s ever happened, it happened on the set of A Prairie Home Companion. And Anderson’s not shy about discussing it; in his foreword to Altman on Altman, Anderson lays out Altman’s ultimate lesson, a comment that the incorrigible iconoclast made to Anderson after one of his famously chaotic takes pleased him especially: “good disintegration.” Altman saw his job as director not only to construct the perfect arena but also to help the acid rain of improvisation strip away everything studied, all the artifice and all the lies of intentionality, so that a deeper, better underlying truth could emerge from the chaos. Altman’s chaos is an incredibly well-managed, purposeful chaos, albeit definitely chaos, as anyone who’s ever tried to comprehend Brewster McCloud will tell you. A Prairie Home Companion was 2005, and Anderson’s next film, There Will Be Blood, might be his least Altman-like — with The Master a close second. Perhaps you could draw gossamer-thin lines back to McCabe & Mrs. Miller, but There Will Be Blood feels like a classicist’s work: the startling, clean compositions; deliberately focused dialogue; and, of course, that exploding punctuation of a finale. While it might be hard to define the idea of “Altmanesque,” an ending like that could top the list of what it’s not. Maybe you find a little more taste of the Altmanesque with The Master’s peripatetic camera catching key moments on the edge of the frame, almost as an afterthought. But again, each film focuses on discretely drawn characters in tightly controlled relational orbit, somewhat counter to the big, wonderfully messy asteroid belt of humanity that typifies the quintessential Altman film. There Will Be Blood and The Master feel like geometrically plotted games of billiards, with characters caroming off each other at well-planned angles and landing in their intended pockets. Altman’s movies, however, function more like a bath of human beings suspended before our eyes in perpetual Brownian motion. So, what happened to PTA’s prayers at the Altar of Altman? It’s as if having peered behind his idol’s curtain, Anderson finally set down the torch he’d been carrying all of those years. Inherent Vice answers that question. First off, whether you couldn’t care less for Altman’s infamous overlapping dialogue or you pray daily in the direction of PTA’s San Fernando Valley Mecca, don’t let anyone tell you how to enjoy Inherent Vice. For me at least, its beauty lies in just how dissimilar it is to anything out there right now, even as it’s warmly familiar. Rambling but intricate, goofily enigmatic yet aiming at a very definite point, and mystically illuminated by pulsar-like bursts of poetry, Inherent Vice is a lovely faded Polaroid ripped from America’s family album. It’s the cinematic analogue of getting hopelessly baked and wandering empty 3 a.m. streets with your best friend as you both incoherently explain fifth-dimensional insights to each other. More concretely, it offers a glimpse of our culture in its gloriously awkward bad-hair phase, filled with good intentions about to sour and a bright-eyed promise that remains perpetually deferred. But as your film-nerd buddies will eagerly inform you, Inherent Vice feels like it took a long, luxurious toke off Altman’s The Long Goodbye. (There’s also a heady hit of another anarchic Elliott Gould–Robert Altman pairing, California Split.) 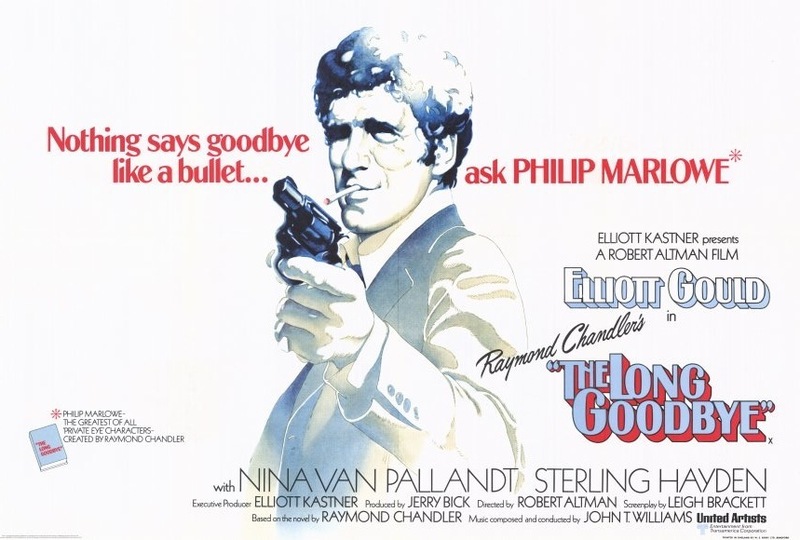 Altman’s brilliant counterculture riff on Philip Marlowe has gotten a second wind these days: The long-awaited Blu-ray finally dropped last month and it’s playing in no fewer than three New York retrospectives right now. Hell, you might even still be able to rent Gould’s Hollywood Hills apartment, apparently untouched by the ravages of time or updated interior design. And, of course, Altman’s Marlowe, anachronistically adrift in the spiritual decay of the ’70s, likely influenced Pynchon, another malcontent who rose to prominence in that age, as he wrote Inherent Vice, which is, among other things, a whimsically lyric and ironic ode to the era. So, it’s no surprise that Anderson would draw from that infinitely deep well of Altman. He makes no bones about who’s inspiring him here: Cinematographer Robert Elswit flashes the negative just like Vilmos Zsigmond did for Altman; the sound mix gives the dialogue that half-heard feel Jim Webb famously perfected for California Split and Nashville. Throughout Inherent Vice, elements continually play like variations on the theme of Marlowe: our hero led to a sinister sanatorium; the beach and its unceasing waves as a constant background image; a pot-addled Eric Roberts mirroring Sterling Hayden’s hilariously drunk ersatz Hemingway. Most significantly, Inherent Vice’s underlying conspiracy emerges only fitfully through the film’s perpetually stoned haze, barely palpable before it slips playfully from your fingers, just as Altman’s hero only slowly and slightly grasps the fool he’s ultimately being played for. But there’s also plenty that sets Anderson’s Inherent Vice apart from being just a retread of The Long Goodbye. For one, it doesn’t start with 10 minutes dedicated to purchasing cat food. Where Altman’s restless camera glides on like a vaguely intrigued passerby, Anderson stays tightly framed on his actors, drawing our attention to their telling reactions, as if his lens suffered a case of stoner’s gaze. And while the sound mix may feel overheard, like you’re always just on the edge of catching its drift, it’s not exactly the elaborate mosaic of pointillist conversations that Altman loved. (The dialogue, far from improvised, is virtually unchanged from the novel.) Pynchon’s rigorous structure and plotting undergirds it all, and, as much as Anderson’s employing all the colors in his master’s paint box, he never forgets that; he’s faithful to Pynchon above all else. What Inherent Vice takes from The Long Goodbye is less a series of homages than a vibe. It’s as if Anderson has finally internalized Altman’s quest for disintegration. For all the ways in which Anderson’s early films beg, borrow, and steal from Altman, their tributes to his ethos felt tightly controlled, like an audacious apprentice trying to do the master one better, full of flashy moves that demand respect without having learned the final lesson. Maybe with There Will Be Blood and The Master, Anderson was beginning to tackle that quest for disintegration on his own terms. (The fancy shots in both of those films feel less like examples of showmanship than opportunities for Daniel Day-Lewis, Joaquin Phoenix, and Philip Seymour Hoffman to disintegrate into stunningly unhinged performances.) Anderson’s first three films feel well directed, but the next two after A Prairie Home Companion feel almost discovered, even as they retain the stylistic flourishes that he’s known for. Inherent Vice feels like a culmination, as if Anderson has organically merged his intensity with Altman’s love for anarchy, accident, and contingency. Inherent Vice feels both indelibly Paul Thomas Anderson and a faithful tribute to Robert Altman. Rather than trying to outdo his hero, Anderson has channeled Altman’s spirit for a work that evokes that special moment of which Altman was an iconic and essential voice. Despite all the zany sight gags and dark humor, Inherent Vice exhibits above all a melancholy for what’s been inevitably lost when society paved back over the cracks inflicted on it by the counterculture and by artists like Altman. So while no one’s ever going to call Paul Thomas Anderson a Little Bobbie Altman these days, I think he’s made a film of which Big Bob Altman would be very proud.